The amenities at Crescent Keyes North Myrtle Beach resort are noteworthy. The amusements and attractions that are nearby are engaging. Regardless of whether you are in North Myrtle Beach to kick back on the beachfront and watch the tide roll in and out or if you are in the Crescent Beach section of town to indulge at the restaurants, shop the outlet malls and see every live show that hits the stage, this is a terrific North Myrtle Beach resort for your family’s vacation headquarters. The Crescent Beach location of this North Myrtle Beach resort only enhances your North Myrtle Beach vacation. It is an oceanfront retreat that is near shopping, dining and live entertainment at Barefoot Landing. The nearby salt marsh and Intracoastal Waterway offer numerous opportunities for fishing, boat rentals, kayaking and more. The beachfront is a natural beauty. A beach chair and sunglasses are really all that you need to have a luxurious afternoon on the white sandy beaches. Take long walks and pick up seashells along the way. Daydreaming is a natural by-product of spending your vacation at the beach. Watching the sunrise, the tide ebb and flow, and the boats bob offshore is serene and tranquil. You will experience a relaxation like never before when you lounge lazily on the white sandy beaches behind Crescent Keyes North Myrtle Beach resort. The oceanfront pool deck at Crescent Keyes is the definition of a special retreat. 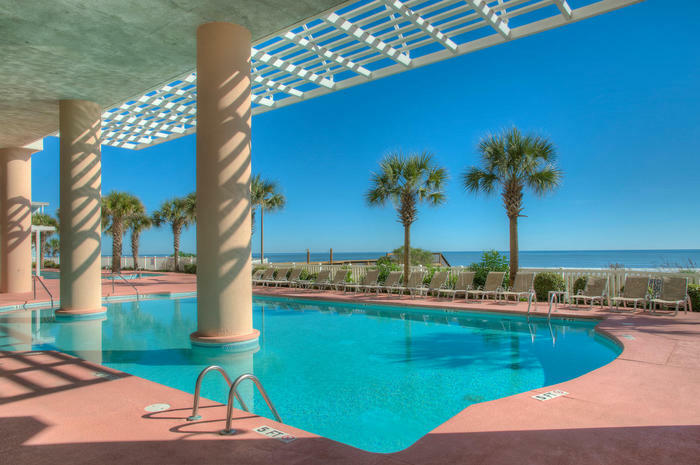 Enjoy your idle, sun-washed North Myrtle Beach vacation day at Crescent Keyes when you spend hours just hanging out on the pool deck and on the beach that is only steps away from the sparkling blue swimming pools. The oceanfront pool deck on the ground level at Crescent Keyes features a wide array of water amenities. A swimming pool glistens in the sunlight on one end while a pair of hot tubs that lure you into the warm, soothing water with bubbles and jets is on the north end of the sun deck. In the middle is a lazy river that is just waiting for you to grab an inner tube and hop in for an effortless ride. The indoor swimming pool at Crescent Keyes is separated from the sun deck by a wall of floor-to-ceiling windows. Take a dip inside while keeping an eye on the fun happening outside. It is the best of both worlds at Crescent Keyes. On the sixth floor of this North Myrtle Beach resort is another pool deck. This one faces Ocean Boulevard and is a delightful gem that is kind of tucked away. This pool deck features a lazy river so there are two of these on site at Crescent Keyes. Be sure to try out both of them and relax fully while floating downstream. Next to this lazy river is a whirlpool and a hot tub. There is also a kiddie pool on this level that boasts shallow water and is perfect for the little ones in your family. Water recreation is easy to find at Crescent Keyes in North Myrtle Beach. The subtle beauty of this North Myrtle Beach, SC hides the fact that it features such luxurious amenities. The North Myrtle Beach vacation rentals at Crescent Keyes range in size from one to four bedrooms. These North Myrtle Beach condos can sleep anywhere from six to 12 people. These North Myrtle Beach condo rentals are patterned after the way you live. They each feature a well equipped kitchen that includes a dishwasher. There is a washer/dryer unit in each rental, too. Having a washing machine and a clothes dryer in your North Myrtle Beach vacation rental at Crescent Keyes lightens your load. Pack lighter and play more when laundry facilities are at your fingertips during your North Myrtle Beach vacation. High-speed Internet is available in all of the North Myrtle Beach condominiums and each vacation rental also has at least one DVD player. From the living room you can access the ocean view balcony. Catch a sea breeze while sitting leisurely on your balcony. Take your coffee to the oceanfront balcony and watch the sun come up during your North Myrtle Beach vacation. Beautiful décor, comfortable furniture and am ambiance that relaxes the senses is what you can expect and what you will receive when you spend your North Myrtle Beach vacation at Crescent Keyes. This North Myrtle Beach resort’s amenities will make your day. Your North Myrtle Beach vacation will be fantastic at Crescent Keyes. Two pool decks, a fitness center, easy beach access and close proximity to all the amusements and attractions make this a preferred beach vacation destination. Condominium rentals at Crescent Keyes are so comfortable you will want to put down roots in North Myrtle Beach, South Carolina.